At a 1962 dinner for 49 Nobel laureates, President John F. Kennedy quipped that the event was "the most extraordinary collection of talent, of human knowledge, that has ever gathered at the White House, with the possible exception of when Thomas Jefferson dined alone." The statesman and author of the Declaration of Independence was many other things besides, including an ardent naturalist. Throughout his time as vice president and president of the United States, he was also president of the American Philosophical Society. Thomas Jefferson admired the French naturalist Buffon, and was consequently quite agitated by Buffon's contention that America's cold, moist climate stunted the growth of its inhabitants. Jefferson (over 6 feet tall himself) spent years — sometimes in the most discouraging moments of the American Revolution — working on his Notes on the State of Virginia to refute Buffon's theory of American degeneracy. The book was a series of answers to a series of queries, 22 of them, posed by the Marquis de Barbé-Marbois. Jefferson had the first edition of the book published in France and, ironically, had another edition printed a few years later by a London-based publisher. In his book, Jefferson compiled tables comparing the weights of American animals and their European counterparts, pointing out the size of the American bear — twice as big as its European counterpart — and the buffalo. In fact, probably the single most convincing piece of evidence for Jefferson's argument had been excavated before he was even born. In 1705, a giant tooth surfaced in the Hudson River Valley. According to legend, the big tooth rolled downhill until stopped by the foot of a tenant farmer who later traded the tooth for a glass of rum. 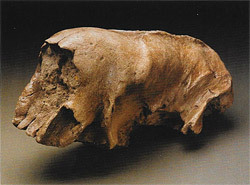 Referred to as "incognitum," the tooth was eventually identified by the French naturalist Cuvier as that of a mastodon. Other teeth and bones turning up in American soil also proved to be pachyderms, some mastodons and some mammoths. Both outsized modern elephants. The American incognitum had a liability, though. It was long dead. He needed something still living in the American wilderness, and one of his correspondents, General John Sullivan, dutifully worked with hunters to find it: a 7-foot-tall moose. Jefferson had the hide, bones and horns relayed to Buffon. Thanks in part to Jefferson's dogged fact finding, Buffon largely changed his mind about American degeneracy. He promised to make corrections in his next book but didn't live long enough. Besides showing them off to the Europeans, Jefferson identified American fossil remains. Shortly after they were unearthed in 1797, he acquired some fossil bones belonging to what he initially thought was a mammoth. After seeing the claws, including the one shown here, he guessed he had the remains of a large carnivore. He named the fossil Megalonyx and wrote a paper for the American Philosophical Society. Before he presented the paper, though, he learned of the discovery of Megatherium, a giant fossil ground sloth from Paraguay. Noting the similarities between the fossils, Jefferson updated his paper before its publication the society's Transactions in 1799. Over two centuries later, a Jeffersonian ground sloth, Megalonyx jeffersonii, turned up in an extraordinary assemblage of Ice Age fauna in Snowmass, Colorado. Although he was a deist rather than a Christian, Jefferson resisted the idea of extinction, unable to believe that God would allow a species to disappear from the face of the Earth. When he authorized the Lewis and Clark expedition, he hoped the travelers would find mastodons still living in America's newly acquired territory. (The explorers never found a live mastodon, but they did send him a live prairie dog.) His hope wasn't as unreasonable as it might sound. Around the turn of the 19th century, few naturalists could accurately estimate the ages of fossils they collected. Without knowing a fossil was millions of years old, one could reasonably guess it might have relatives still wandering the wild. 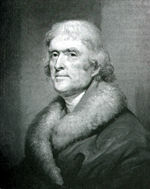 In the American Philosophical Society, Jefferson served as councilor, vice president and president in the 1780s and 1790s. In 1807, he commissioned William Clark to collect roughly 300 fossils, the best of which Jefferson donated to the society. (The inferior specimens he kept for himself or sent to the Musée National d'Histoire Naturelle in Paris.) Jefferson also championed the museum founded by Charles Willson Peale in 1784, a uniquely successful 18th-century American museum. In addition to natural history, Notes on the State of Virginia addressed the issue of race — probably the most frustrating issue for Jefferson's admirers. Although Jefferson opposed (in theory if not in his lifestyle) the institution of slavery, he maintained that Africans were inferior to their white masters. (He was more charitable toward Native Americans, perhaps to better prove his point about America to Buffon, though they, too, were inferior to white men in his assessment.) George Washington made arrangements to free his slaves after he and his wife died, but Jefferson made no such arrangements, and he even wrote to then-president Washington that the slavery business provided Monticello with a 4 percent profit each year. Some historians have speculated that Jefferson made peace with being a slave holder when he realized how profitable the production of slave children could be. Slave-holding Jefferson figured as the chief antagonist in the 2015 hit Broadway musical Hamilton . When Jefferson and Hamilton engage in a rap-battle cabinet meeting, Jefferson advises against taxing the south because its debts are paid, to which the abolitionist protagonist Alexander Hamilton shoots back, "Your debts are paid 'cause you don't pay for labor." But even in Europe a change has sensibly taken place in the mind of Man. Science had liberated the ideas of those who read and reflect, and the American example had kindled feelings of right in the people. An insurrection has consequently begun, of science, talents, and courage against rank and birth, which have fallen into contempt.